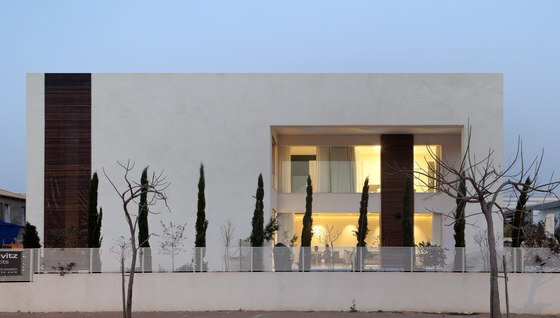 The owners of the house, which is located in Savyon, came to architects Hila and Dan Israelevitz with a reasonably standard program, with no wild whimsies – all they wanted was a modern house which is open to the outside, functional and convenient for everyday conduct, and suitable for their lifestyle as a family with three children. 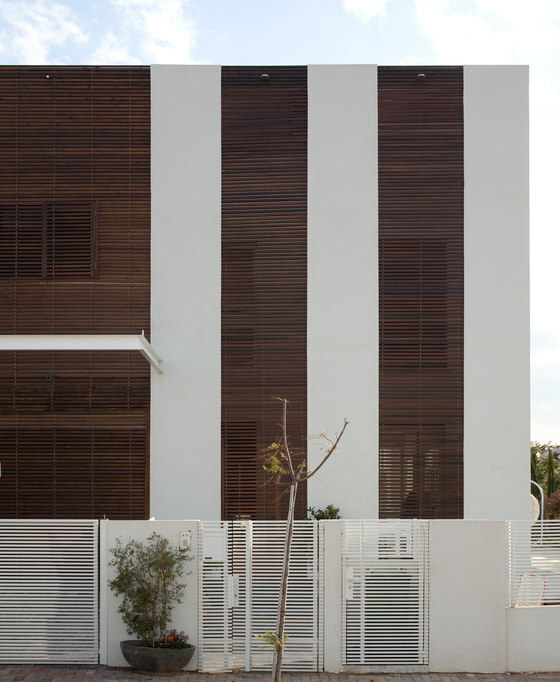 The two-story house, one half of a two-family house which resides on a rectangular corner plot of land, was planned as one piece, rectangular in shape as well, and its front façade is exposed as a reasonably reserved and sealed composition, into which integrate vertical concrete “belts” with horizontal cedar lattices extending up its entire height. 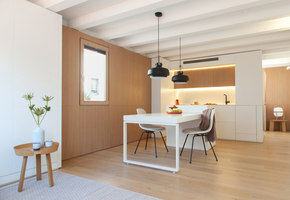 A number of wide stairs lead from the front gate of the yard to the door, which is assimilated into the wood lattices, but its opening is surprising, since instead of coming into the house as expected, the guest is greeted by a wood covered space open to the sky, as a sort of additional step in the entering process, and a preliminary chapter to the interior space. 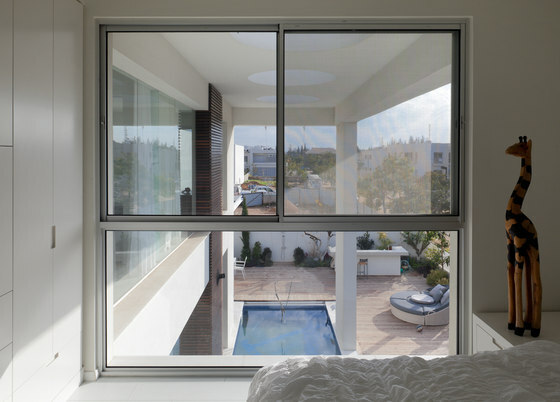 A large window which divides the morning yard and the interior space provides the guest with a primary glimpse, but only when opening the “real” door the covering intimacy of the wood is replaced with a feeling of openness, when the space is discovered in its fullness – airy and expansive, delineated by large windows which reveal a covered swimming pool that flows parallel to it, and in fact almost touches it. 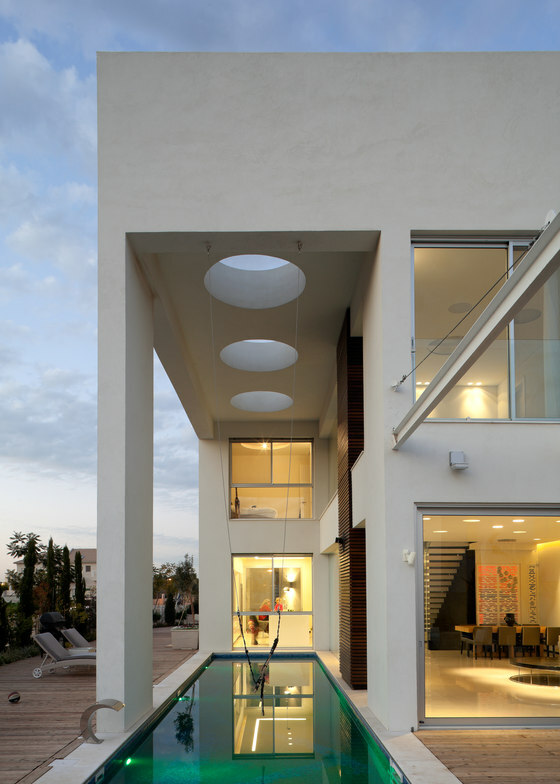 The swimming pool is located right behind the large windows and adjacent to them. 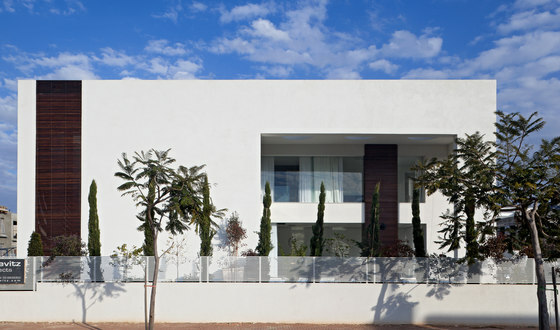 This location is the outcome of mass reduction in this façade of the house (the wide façade facing the adjacent street), and thus changes its exterior appearance, and when looked at from the outside a sharp transition is created from the reserved closure of the entrance façade into transparency and openness. 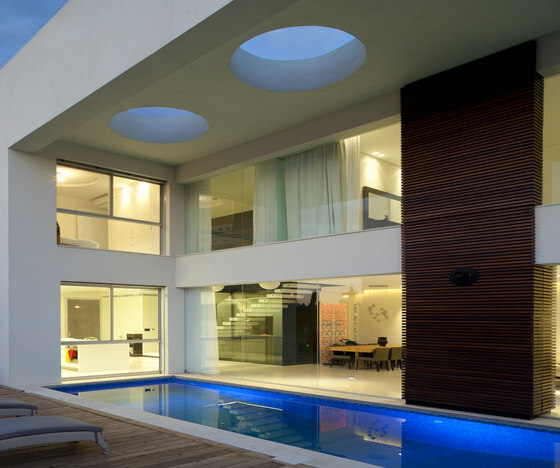 The concrete beams that covers the pool have three round fairly large openings, created for light control of the sun beans penetrating through them, and incidentally create sort of light rings which are “tossed” downward while creating an enchanting sight. 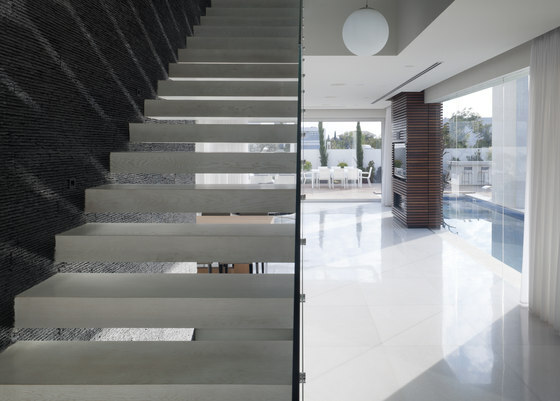 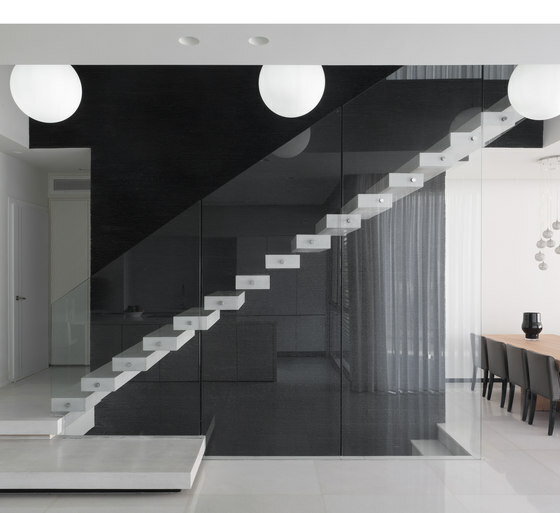 The ground floor space contains the common functions and stairs into the basement, its language is white and minimalistic, spread over a dimension of hovering. 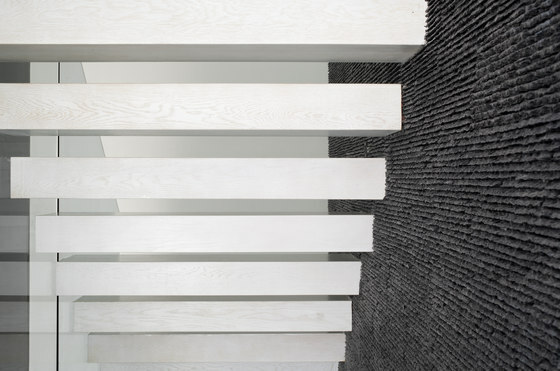 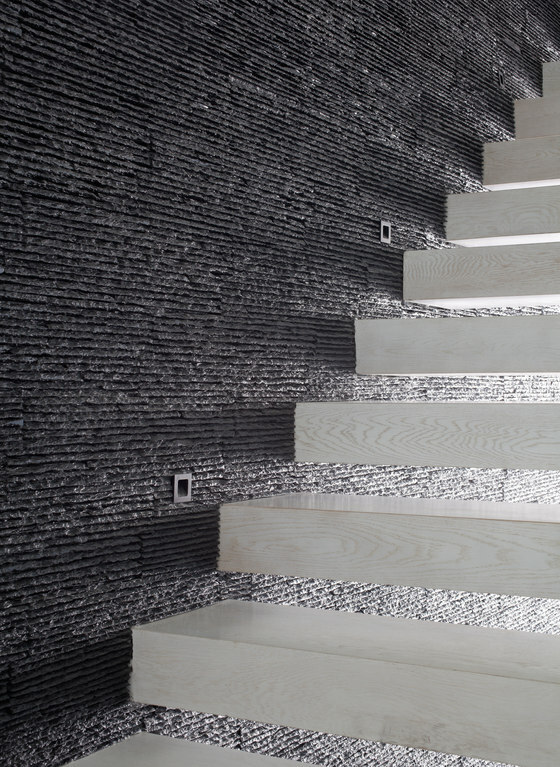 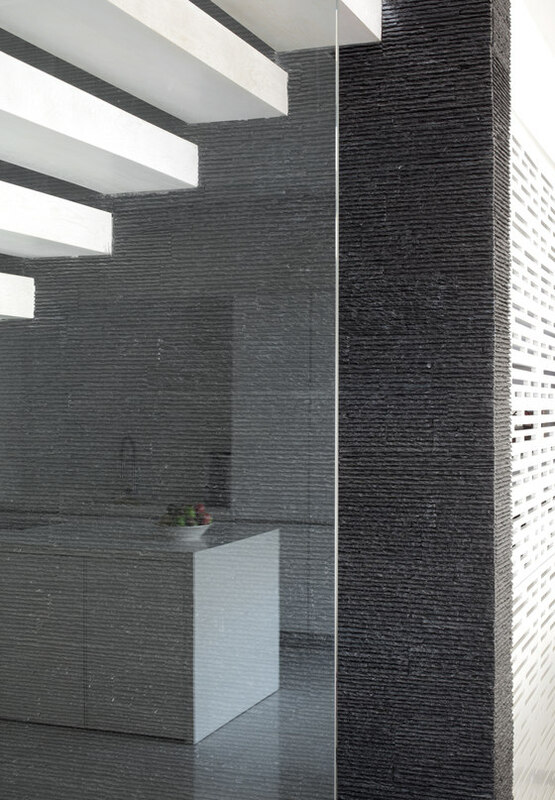 The white airy tapestry is dramatically broken by a wall covered with grooved striped black stone which casts it with a completely different dimension. 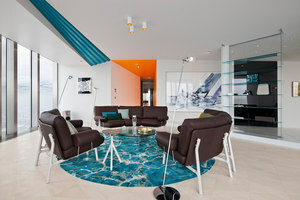 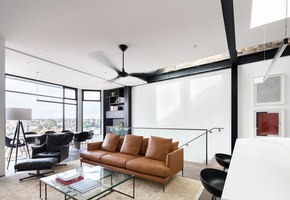 The feelings of connection and flow characterize the space, in which detail and long view axes are entwined, in different forms of material uses. 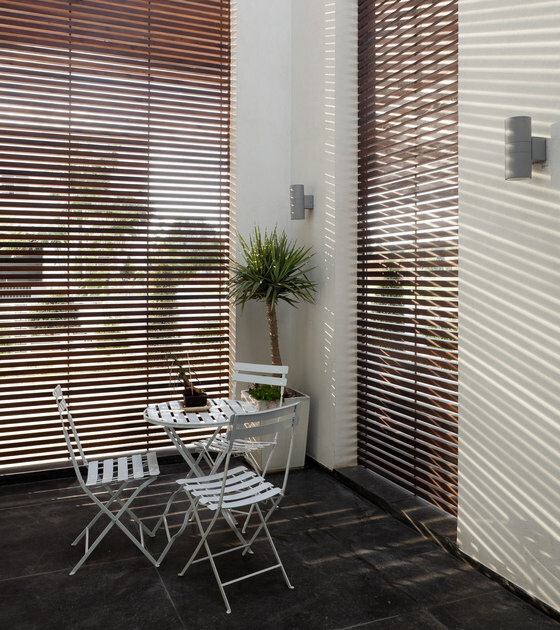 A considerable amount of glass, of which transparency enables direct eye contact, or an especially interesting use of wood lattices which echo the front façade. 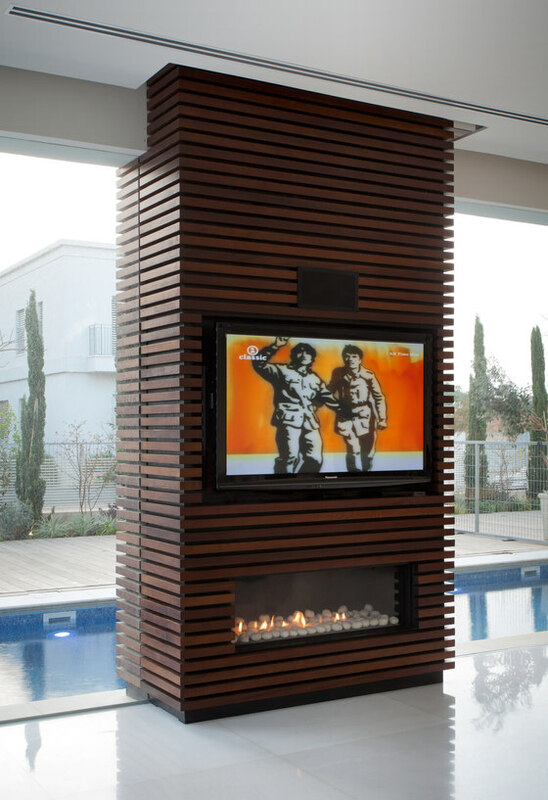 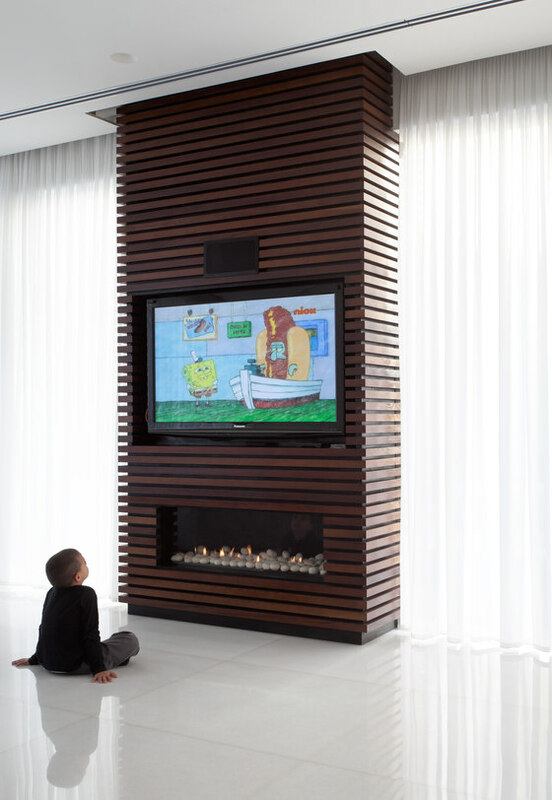 A wall covered in wood lattices which turns to the pool, and at the same time penetrates the interior space and combines in it as an element which contains a television screen and a built in fireplace. 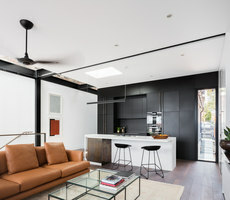 An additional interesting detail integrated in this space recruited the facades of a large electrical cabinet which contains the smart house system infrastructure in favor of the design: a geometric model was planned for the facades which close it and the LED light sources which were installed in it, and distribute red lighting in the evening time, turn it into a unique aesthetic element. 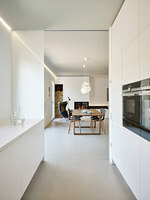 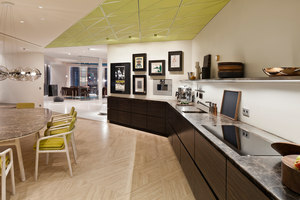 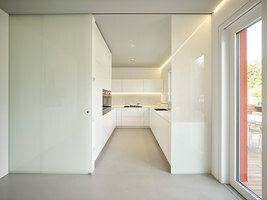 The space lighting is mainly based on sunken light sources, with the moderate addition of hung light sources – three of them which descend from the top floor ceiling down to the front of the stone wall in the ground floor, and intensify-accentuate the relationship between the floors, and smaller light sources which were integrated over the island unit in the kitchen. 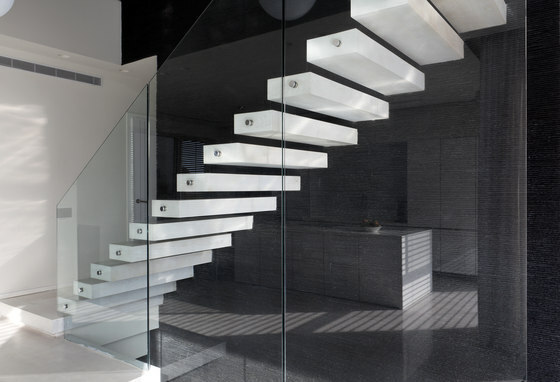 The staircase which is accompanied by the stone wall is delineated in a glass divider which was installed only with connectors, with no additional accessories, and it conserves its “net” transparency, and the console-floating stairs are made of whitened wood. 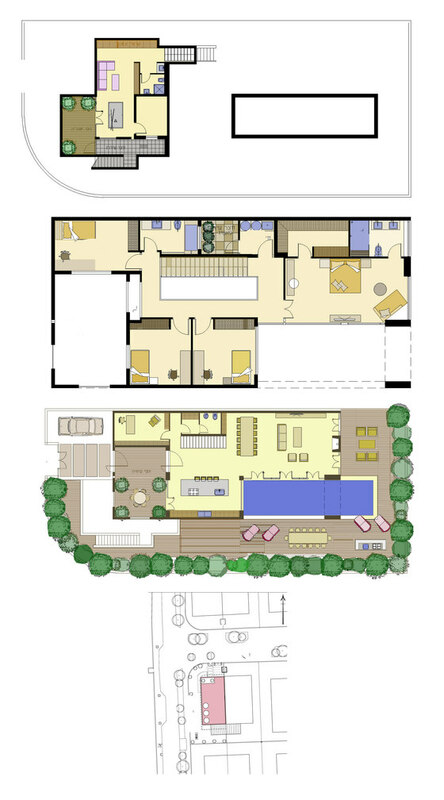 The top floor includes the bedrooms – a parental unit in the front and three children’s rooms located along a passageway delineated by a glass banister.